For just a moment (while reading this blog) assume that God does exist, that He is shaping history, and that He is moving humanity toward some destiny. Wouldn't you like to know about all of that if it really were true? A game show is a type of radio, television, or internet programming genre in which contestants play a game which involves answering questions or solving puzzles usually for money and/or prizes. 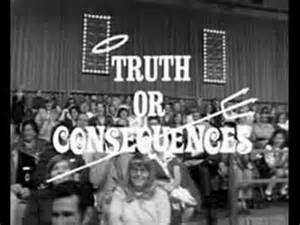 You’ll probably recognize game show titles like Let’s Make a Deal, Jeopardy, Truth or Consequences, I’ve Got A Secret, and To Tell The Truth. There are 3 doors, behind which are two goats and a car. You pick a door (call it door A). You’re hoping for the car of course. Here’s the game: Do you stick with door A (original guess) or switch to the other unopened door? Does it matter? Surprisingly, the odds aren’t 50-50. If you switch doors you’ll win 2/3 of the time! Today let’s get an intuition for why a simple game could be so baffling. The game is about re-evaluating your decisions as new information emerges. Now, let's find out more about the love connection! Saint Valentine's Day is a Big Deal and a celebration of the love connection. Here's a picture I took on February 14, 2010. The start of a game show love connection for me. It was a game in my head to figure out if this show (Liturgy) was for real or not. I admit, my heart was filled with love on that day. I had high expectations. However, the door of doubt was there too. I had captured images not visible to the naked eye before and wondered if I could capture more images of maybe Christ coming down to enter the bread and wine. Hallelujah! I captured a bright light which filled the domed area where the altar and priest were located. It's not sunlight; it's not the altar lights turned on high, or a light source that is visible to the naked eye... for that matter. Did I cause this to happen with my passionate focused thought? Did I capture Christ's (light) presence behind the veil (door)? Or, was it just an anomaly? 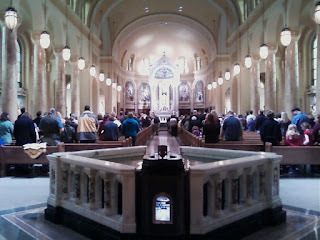 The picture below is a normal view of the altar. I recalled a passage I had read of a scientific study by PEAR: "...Princeton Engineering Anomalies Research Scientific Studies of Consciousness-Related Physical Phenomena, which since 1979 has gathered “clear evidence of an active role of consciousness in the establishment of reality…" And, "...the PEAR findings consistently show that although the effect of consciousness upon random generating devices in each experiment is small the recurrence of these small effects is very high." Did I create this reality? Many mainstream theories claim religious rituals, magic, and the existence of other dimensions are hocus pocus. Yet, one of the world’s largest and most respected centers for scientific research, CERN, has publicly stated that a significant part of their research involves the exploration of alternative dimensions. Would science say I created the bright light? It was time to take up the gauntlet! This experience went beyond a vision or dream that I could easily contribute to the spiritual realm. This experience was documented in a photo. I've been searching for the answers to my questions for six years. Did my thoughts create that bright light, did a real portal open up to another unseen realm (spiritual realm), or was it all just a strange coincidence? This quest has definitely manifested a lot of information for me to evaluate! The collective unconscious is apparently ready to tackle the unseen world too as we can find tons of information or many doors to open on the subject of unseen realities. It's similar to the game show host problem... and it's all about re-evaluating your decisions as new information emerges. Then... the priest elevated the broken Host and proclaimed, "This is the Lamb of God." He didn't proclaim this is the door to heaven. 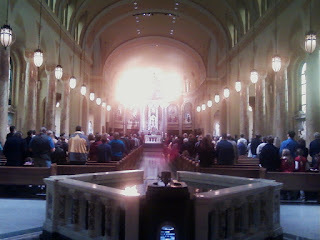 However, I captured an unseen energy encapsulated around the altar after those words were spoken. Of all the titles that could have been used such as ...Lord, Savior, Messiah, King, or Prophet... he used "Lamb of God." To explain the significance of this title, I'll present a brief excerpt from The Lamb's Supper by Scott Hahn. To ancient Israel, the lamb was identified with sacrifice, and sacrifice is one of the most primal forms of worship. As early as the second generation described in Genesis, we find, in the story of Cain and Able, the first recorded example of a sacrificial offering. "Cain brought to the Lord an offering of the fruit of the ground, and Abel brought the firstlings of his flock and of their fat portions” (Gen 4:3-4). In due time, we encounter similar burnt offerings from Noah (Gen 8:20-21), Abraham (Gen 15: 8-10; 22:13), Jacob (Gen 46:1), and others. In Genesis, the patriarchs were forever building altars, and altars served primarily as places of sacrifice. In addition to burnt offerings, the ancients sometimes poured "libations," or sacrificial offerings of wine. Of the sacrifices in Genesis, two deserve our most careful attention: that of Melchizedek (Gen 14:18-20) and that of Abraham and Isaac in Genesis 22. Melchizedek appears as the first priest mentioned in the bible, and many Christians (following the Letter to the Hebrews 7: 1-17) have seen him as a foreshadowing of Jesus Christ. Melchizedek was priest and king, an odd combination in Old Testament, but one that would later be applied to Jesus... Finally, Melchizedek's sacrifice was extraordinary in that it involved no animals. He offered bread and wine, as Jesus would at the Last Supper, when He instituted the Eucharist. 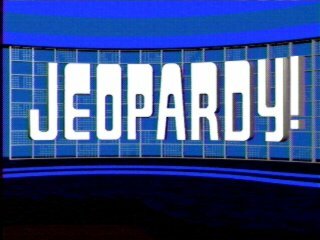 "Jeopardy!" is a classic game show -- with a twist. The answers are given first, and the contestants supply the questions. Are we in jeopardy of not asking the right questions? Ancient Knowledge is being unearthed daily! Stories abound with portals to other dimensions, ancient pyramids that emit energy, DNA analysis from skulls that prove they weren't human and ancient civilizations with extraordinary intelligence. Many of the ancient cultures built altars, performed ritual sacrifices, and appeased their gods. So what's up with the Almighty God and bread? We must ask the following: Why was the Land of Israel deprived of the manna? The answer to that question is as follows: In the desert, everything of a physical and materialistic nature stems from external forces. Those entities are essentially impure and grow in a land that is ruled upon by "foreign archangels". Therefore, the fruits that grow therein cannot be worthy vessels to contain the spirit of holiness. This is because an impure body cannot become the vessel for the spirit of holiness. If there were to be some holiness in its fruits and food products, they would be provided for by their [evil spiritual] rulers. Yet that possibility could not exist when it came to manna. This is because the manna comes from heaven, a place where the forces of the "foreign archangels" have absolutely no grasp. Recently, I had a mystical experience on a visit to the Falls of the Ohio. I searched the Internet for articles on holy sparks falling from heaven, and discovered that article on manna. Although there are few words to describe what I actually saw, I'll try to explain what happened. As I looked out over the Falls of the Ohio, the sunlight danced on the water, and the sunlight turned into tiny bright sparks of light. I understood how the heavens could interact with the elements. Wine and bread for Mass made perfect sense to me now. Could the bright light, the well bread, and the Host refer to the vessel for the spirit of holiness? Truth is all around us! You just need to seek it. The collective unconscious is apparently ready to tackle the unseen world too as we can find tons of information or many doors to open on subjects of unseen realities. It's similar to the game show host problem... and it's all about re-evaluating your decisions as new information emerges. This is happening in more than the scientific and religious realms. Unseen realities are being exposed in our economics as well. I received an email last night with the following conversation about our economic situation. The conversation is about Karen Hudes' effort to bring humanity's gold out of hiding. I know of the Power Transition Model and its accuracy of a favorable outcome for humanity. Those that do the bidding, for whatever reason, for the Network of Global Corporate Control should consider they will eventually need to interact with those that are being suppressed. So far the people haven't fallen for the N.G.C.C tricks. I totally agree...that if humanity didn't have options then this would be a completely different game. What information do we have that will lead to the right questions? The nebular hypothesis is the most widely accepted model in the field of cosmogony to explain the formation and evolution of the Solar System. It suggests that the Solar System formed from nebulous material. The theory was developed by Immanuel Kant and published in his Universal Natural History and Theory of the Heaven. Originally applied to our own Solar System, this process of planetary system formation is now thought to be at work throughout the Universe. What if the Solar System wasn't a random act of nature and gravity had nothing to do with it, then some higher intelligence created it. What if it all revolves around YOU? 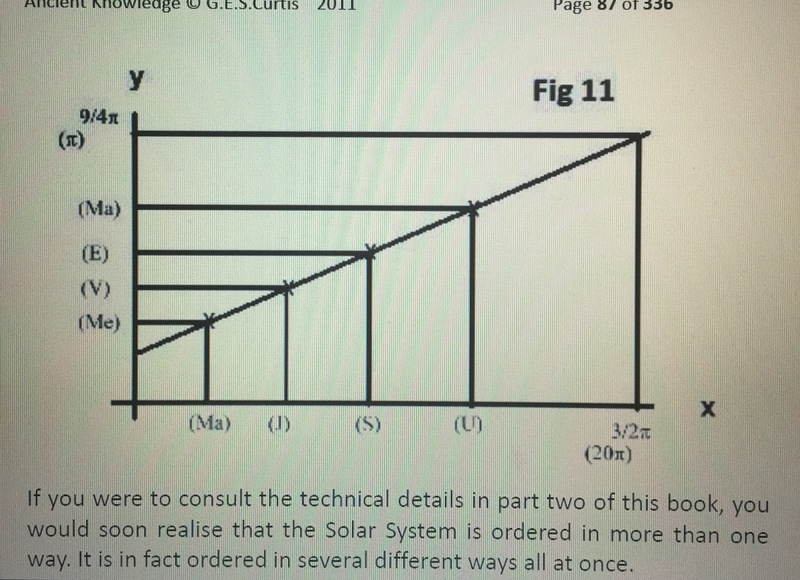 I'm going to highlight one particular question by G. E. S. Curtis. 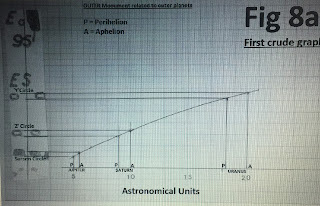 Astronomers have been studying and measuring the Solar System for a century or more, yet they have failed to notice the simple fact of order. If astronomers cannot account for the origin of the Solar System; which is its own back-yard, why should anyone listen when they pontificate about the origin of the entire universe? On his adventure, he discovered a mathematical equation that may explain why the antediluvian civilization needed a sacrifice, built temples, and was obsessed with the heavens. I started this book by saying it is a treasure hunt, and so it is. The treasure we seek is the ancient antediluvian knowledge that I claim, hypothetically, exists in the ground plan of the ‘migdal’ of Babel, which I have tentatively identified with Stonehenge. The rough preliminary investigation had convinced me that there was indeed a relationship between the ground plan of Stonehenge and the ‘heavens’. This changed my attitude towards the ‘myth’ of Babel, permanently. The two graphs, crude though they might be, could not be ascribed to chance. The graphs demonstrated that I could well have been right about Babel, and it followed that I was looking at the work of an antediluvian man. 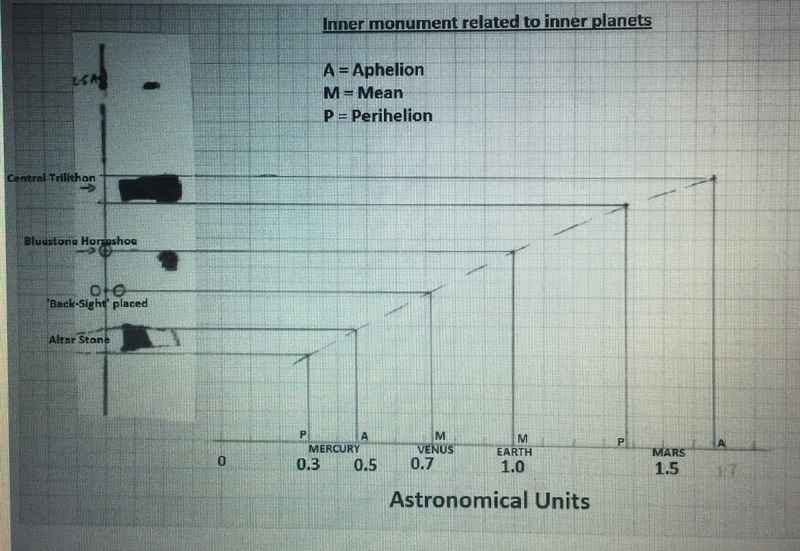 The inner monument related to the inner planets! 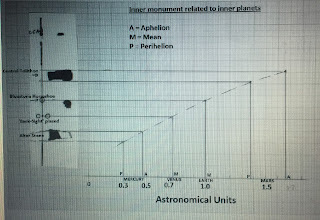 The outer monument related to the outer planets! I am proposing that Stonehenge is in fact that ancient mythological structure known in the Bible as the ‘Tower’ of Babel. I say this because it is obvious (to me) that the builders were from an advanced civilization, they were certainly not Neolithic. We started in the Biblical book of Genesis, discussing the Elohim and the Creation and the flood and Noah. We progressed from Noah to Babel; and from Babel to the ground-plan of Stonehenge. We deduced that Stonehenge ground-plan was plotted on the ground with a peg-and-string method. 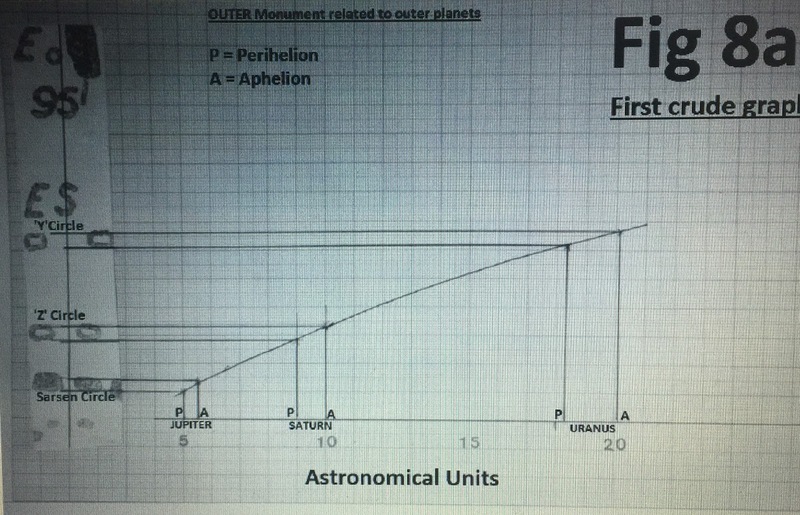 From this we were able to obtain two exponential equations that related the planetary orbits to the monument. This combined equation demonstrates that there is order in the orbits. The order in the orbits is so multi-layered that it cannot be due to chance or natural causes. 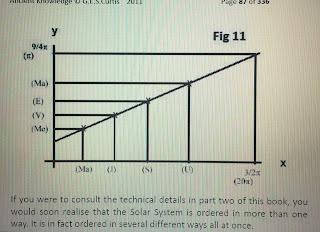 The equation efficiently describes order in the Solar System, and does so without the need for gravity. Our views on the origins of the Solar System would need to be changed. There is order in our Solar System and God created that order for a reason. I believe God stopped progress on the "Tower of Babel" because He had another plan for his relationship with US. Yes, it includes monogamy and sacrifice. He did not want those entities barred from Heaven tricking humans into opening the wrong door. And, I give thanks to God for my experience on Valentine's Day which opened a door for me to have deeper relationship with Him. For me, God does exist, He is shaping history, and He is moving humanity toward some destiny. In my opinion, "This is because the manna comes from heaven, a place where the forces of the "foreign archangels" have absolutely no grasp." Remember in this game the impostors are allowed to lie but the central character is sworn "to tell the truth."